"You can build a future out of anything. one foot at a time." I'm scared. Nervous. Slightly tachycardic. Maybe a little more than anxious. 2 reasons. 1. Again, because writing this review will be difficult to put in words how amazing it truly is. 2. Because I finished Pandemonium, now I have to read Requiem...and I'm scared. In both good and bad ways. I cannot WAIT to find out what happens...but the other part of me wants to live in ignorant bliss a little longer because I have NO idea what is going to happen...Eep! Ok, whatever, who am I kidding? I'm gonna speed write this review, gush about it's amazingness and then spend the next 7 hours binge reading Requiem until it is finished. Let's be honest, here. Ok, SO! 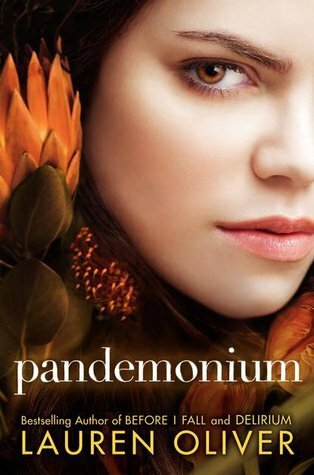 Pandemonium is written Then and Now. It picks up with Lena's story about how she found life in the Wilds and where she is now, which is New York City. Her tale is heart-breaking yet so inspiring all at the same time. This is due, obviously, in all parts to the writing. Hot damn, Lauren Oliver, do you know how to write emotions! Seriously! The heart-wrenching agony I feel while reading Lena's story makes my chest hurt. The prose is beyond beautiful and these novel are truly story-telling. Her words are raw and honest and so emotionally driven you feel like you are right there beside Lena the entire time. Utter skill. No two ways about it. Oliver is a ridiculously talented writer and I read in awe. As hard and emotionally draining as it was to read about the horrors of what Lena has had to do and see to survive, these were some of my favorite parts. If I thought Lena transformed in the last book, honey, I ain't seen nothin yet. Lena is a force to be reckoned with. She pushes herself to the brink of destruction every single day not only to grow and become strong again...but also to possibly not have to wake up the next morning. That line in the book broke a part of me because it was filled with so much raw truth and complete agony that I felt what Lena was feeling. Her despair. Her lack of hope. Her whole world fell apart in front of her eyes right when it was supposed to be starting. Sad does not begin to delve into the depth of her emotional psyche. Reading about her journey to become a new Lena was nothing short of brilliant. I loved it. Can't say it any better than that. Julian was a great addition to the fold. Watching his journey mirror Lena's from Delirium was so clever. Lena became the Alex to Julian and in doing so, Julian did many of the same things Lena did in the first book. His stories and life experiences had my heart breaking for him as well. He was not as clear and cut-out of a character as we were initially introduced to. He has layers. Hopes. Dreams. Fears. While he in no way got into my heart like Alex did, I do really like him as a character. The other periphery characters I also really liked. Raven, Tack, Sarah, Hunter and Blue all had distinct voices and I would love to get a little bit more on their background, but alas, the book can only be so long. The ending...oofta. Ripped my heart out much like the first book. I cannot lie though, it wasn't too much of a shocker to me. To be perfectly honest, I was expecting it the entire book, it was more of a when kind of thing for me. Which is fine, I didn't feel ripped off even though I had a feeling of what was going to happen, I wanted it to. This book is phenomenal. The writing is beautiful. The characters are real. The ending...I can't even talk about the ending because I need to go read what happens next as to not dwell and start crying again...until Requiem!!!! I am getting ready to read this one I held off my need to read until I got my arc of Requiem and I cannot wait to read it because the ending of Delirium had me in tears. Great review!! you made me want to read it right now.